Ore Detector is a very simple and convenient way to quickly find expensive ore without digging mines and tunnels. The mod changes the standard function of the compass and now it works like a metal detector. Take the compass and tap to the place where you want to dig. After a second, all the information will be displayed in the chat, you will see the name of the ore and its number of blocks. The detector works with a limited area but at great depth. 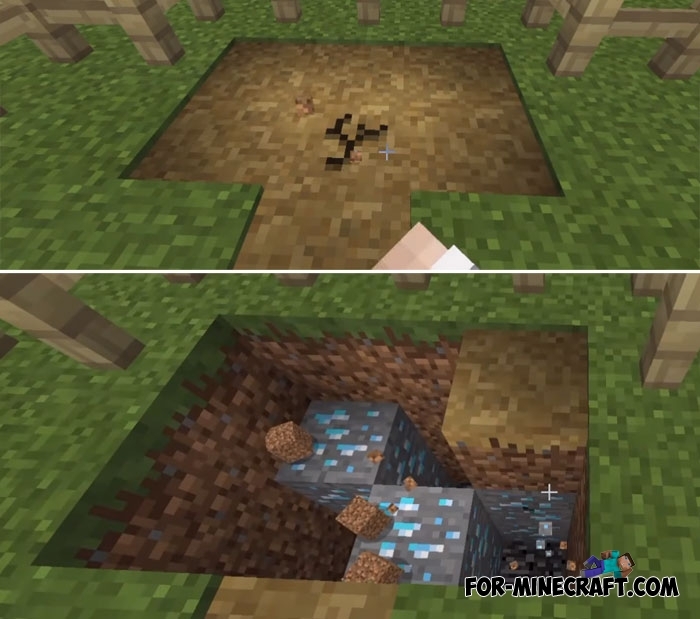 So craft the compass, take a good shovel and pickax and go for the valuable ore. The Ore Detector mod saves a huge amount of time for which you can collect several such diamonds. Someone might say that this is a cheat and in principle it is true, but most likely you have not seen real cheats such as the Vertex hack which allows you to change almost any parameter of Minecraft PE. If you want to make life even easier for yourself and reduce the amount of time spent on felling trees, then install the TreeChopper mod.